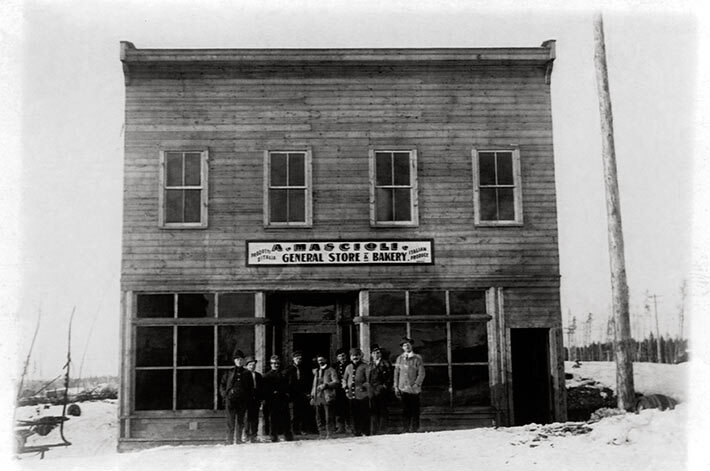 Black and white photograph of A. Mascioli General Store & Bakery, Timmins, ON, date unknown. A group of unidentified men are standing along the storefront; snow is visible, indicating the picture was taken in winter. According to family, the store (located at the corner of 3rd Avenue and Spruce Street) was the first in the area. The store is built of wood planks. Telegraph poles are visible in the right background. The settlement of Timmins began with the discovery of gold in 1909. The resulting gold rush led to roughly 30 mining operations within a year of the discovery. Work in the mines was so difficult and dangerous that English Canadians, or native-born Canadians, were often unwilling to engage in this type of labour. As a result, mine owners sought immigrants to fill these positions. Italians were among these immigrants. The sign for the store notes "Italian Produce/Prodotti D'Italia", and was likely catering to these Italian immigrants. Antonio Mascioli, was arrested on June 10, 1940 and interned as a threat to the Canadian state.